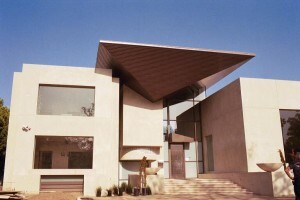 In this Beverly Hills private residence we did an installation of a Linear Metal Ceiling which was in the shape of an inverted hip roof. It started outside the house and gave the visual illusion of continuing through the walls and out the back of the home. 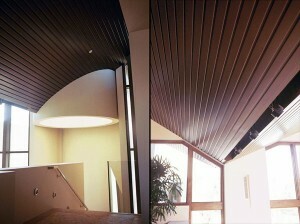 These are two views from the inside of the house focusing on the “inverted peak” as it travels through the home and around a circular staircase. In the bidding stages, when the ceiling manufacturer’s representative was asked who he know who would be able to install this work, he replied saying that there were only two ceiling contractors in the state that he knew of who had the skill level to perform the task at hand. When the other company he referred reviewed the plans for the project they decided that they did not want to touch it. At this high skill level, we have no competitors in our field!